130gms Gloss Art Paper, Double Sided. 5-7 Working day turnaround from when artwork is received. A DRAFT will be sent for you to approve so PLEASE double check your artwork carefully before sending as mistakes cannot be rectified after printing has commenced and refunds cannot be given. Here’s To Your Ultimate Success! I ordered my leaflets from Suzie and they arrived, perfectly printed, within a few days! Suzie provides a fantastic service and is very helpful with lots of useful advice. Great price too! Excellent quality, timely delivery, great price!!! Sue was very helpful and the service was very quick. Impressed with the quality of leaflets as well. Will use again. Ordered leaflets, Sue even designed it for me, great communication with updates regularly to keep me up to date. signed prrof off and within days they arrived…..excellent!!!!! Got more customers for her too!!! Great prints, excellent value for money. 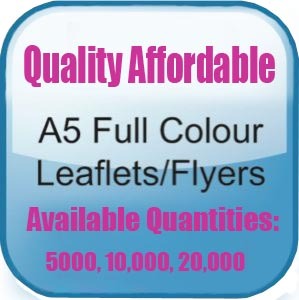 Leaflets arrived on time and free delivery . Perfect !! !